It's been a while hasn't it? I'll save my ramblings on that for another day, but for now I wanted to share my current favourite hair products with you as I have massively mixed things up over the last few months and my hair hasn't felt this good and healthy in the longest time. I always contemplate whether or not to do a gift guide every Christmas, but sure enough, I always cave! I know there's so many around and you're probably getting sick of them by now, but putting them together makes me feel so festive, I just can't resist! I've had the Christmas tunes blaring all day and I'm so ready for it! 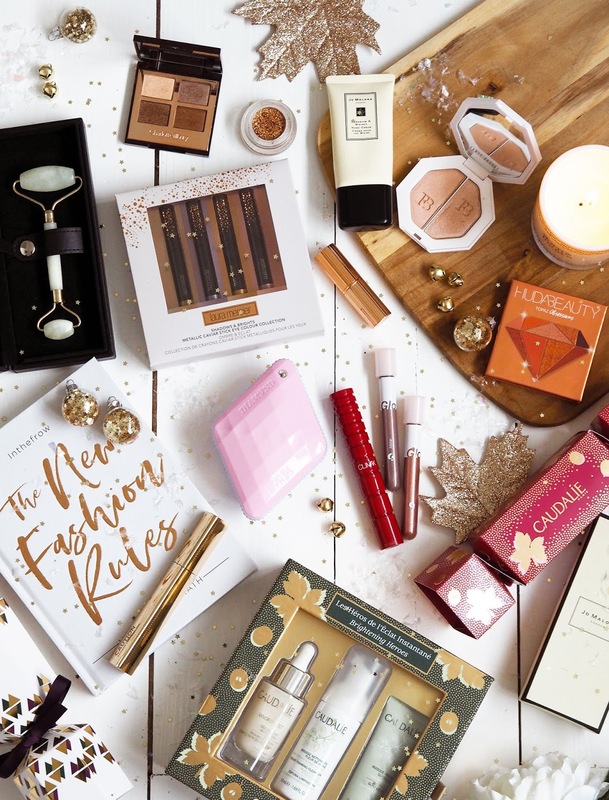 I think that small beauty picks are perfect for stocking fillers, especially if they're little luxuries that you wouldn't necessarily buy yourself. Mascaras such as NARS Climax and Hourglass Caution Extreme Lash will without doubt always be a hit. They're two of the most talked about mascara launches of 2018 and not only do they both give amazing volume but they're also darn nice to look at. For eyes a gorgeous pot of glittery goodness like the Tarte Chrome Paint Shadow Pots will always bring a smile. They have the most gorgeous finish and are intensely pigmented. They also have a cute mini gift set that's worth picking up too. The Glossier Lidstars are super cute and have such a gorgeous subtle long lasting finish that I'm addicted to. Plus you can get a duo with a little discount so that's one to give away and one to keep, am I right? Anything from Charlotte Tilbury makes me swoon, especially a gorgeously packaged Pillow Talk lipstick. Jo Malone isn't the most affordable brand but if you wanted to gift a little luxury, the Jo Malone Geranium and Walnut Hand Cream is so silky and divine. It's my all time favourite and I'm sure you know someone who will love it too. For hair, the Hair Podz Diamond Brush* is a genius product. Not only does it gently detangle tresses, but the bottom pops up to reveal a rotating mirror and a secret compartment to house your hair grips and bobbles. Everything you need for keeping your hair under control when you're on the go. It also has a rather fancy Swarovski crystal on it if that wasn't enough. I absolutely adore gift sets. They provide the perfect opportunity to try out something new in a smaller size before committing and they also come gorgeously packaged in a box, ready to wrap or to pop into a gift bag with some fancy tissue paper. 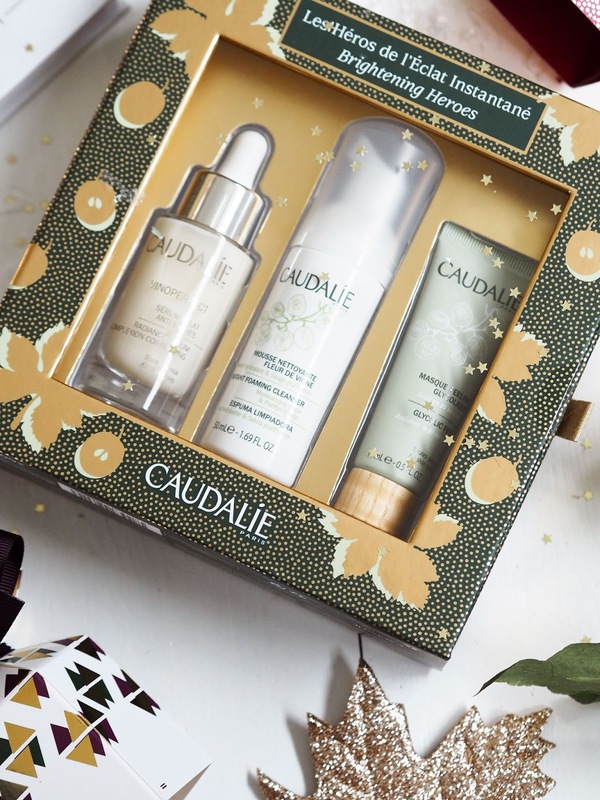 Caudalie do gift sets so well, they also do them all throughout the year so I pick them up for myself quite often as they're really economical. What I love about them is that they include a full size item which is the price of the whole set and a couple of travel sizes to try out. My top pick this year is the Caudalie Brightening Heroes Set*. 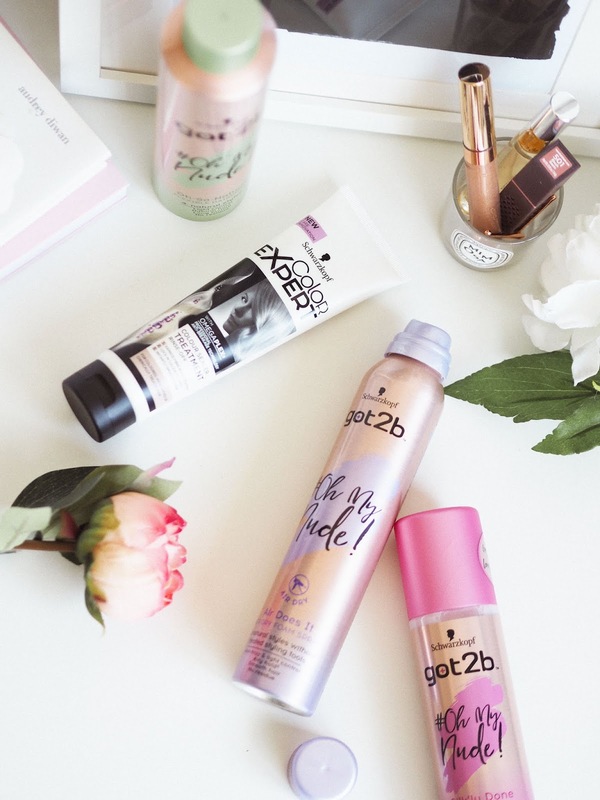 Their Vinoperfect range is one of my faves and gives even the most dull complexions a glow! There's also this cute little Caudalie Vinosource Christmas Cracker* which is perfect for a table setting or a Secret Santa gift. Inside there's three hydrating skincare products, including the Vinosource Moisturising Sorbet which is perfect for any skin type. A great gift to give in this cold moisture sucking weather. Laura Mercier release a Mini Caviar Shadow Stick Collection set every year and this year's is as beautiful as ever. The colours are extremely wearable and intensely pigmented. They go such a long way I think it would be impossible to use up a full size so these smaller ones are great value for money. Jade rollers have been quite big for a few years now and out of all of them available, the Yu Ling Double Jade Facial roller comes beautifully boxed and ready to gift. The larger end is perfect for boosting circulation and sculpting the cheeks and jaw, and the smaller end is perfectly sized for around the eyes, removing any puffiness and giving the feeling of calm. 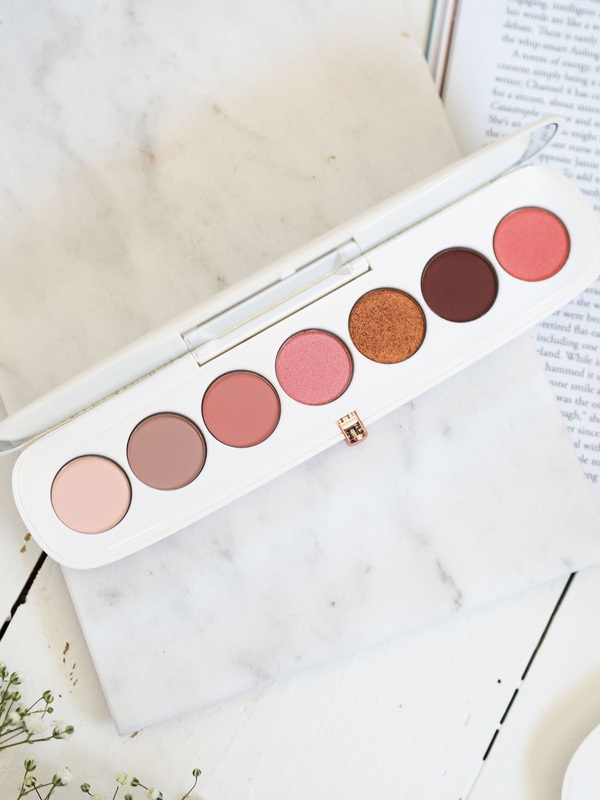 If you're in the market for a pretty palette, I think Charlotte Tilbury offer some of the best around. The Charlotte Tilbury Luxury Palette in Golden Goddess is so universal and never fails to impress. If colour and a wider selection of shadows are your thing, the new Huda Beauty Topaz Obesssions Palette is a dream for any warm eyeshadow palette. The other colour ways are also lovely but this one really stands out. 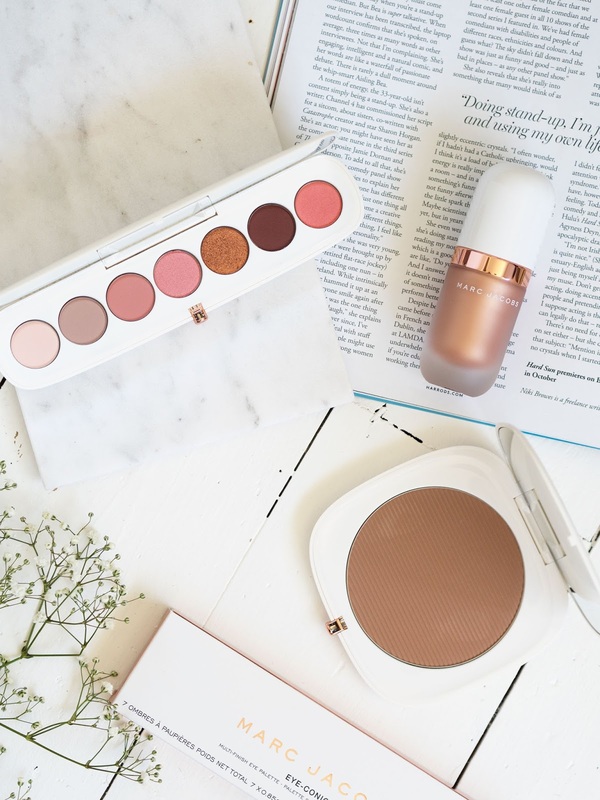 Moving on to cheeks, there's the Fenty Beauty Killawat Freestyle Highligher Duo which gives the best of both worlds: an intense highlighter or a more subtle glow if that's your thing. 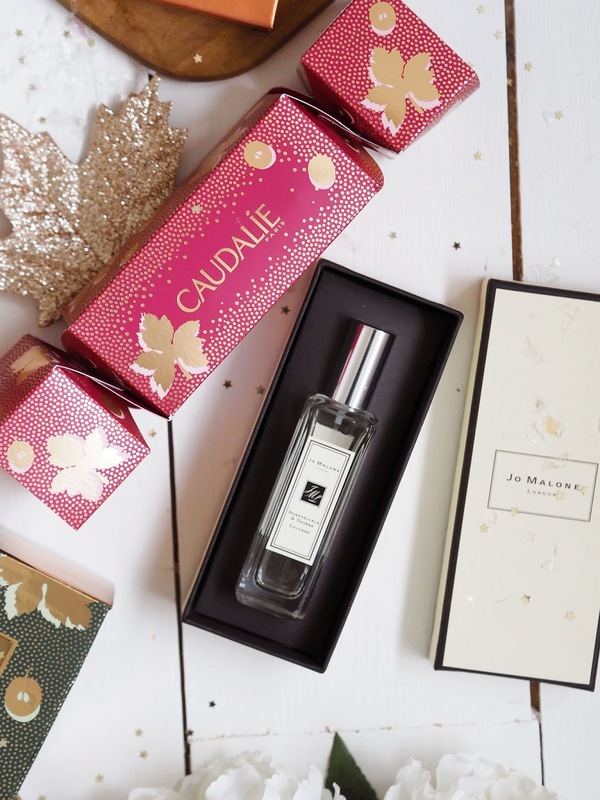 I can't do a gift guide and not include a Jo Malone fragrance. I can't think of a single beauty lover who wouldn't want to unwrap a Jo Malone cologne at Christmas! Jo Malone Honeysuckle & Davana will appeal to most as it's a mix of florals and woodiness. It's fresh and elegant and always pulls in a few compliments. It reminds me of a walk in the countryside on a fresh sunny autumn day. This might not be the best heading but I didn't know where to put this one! 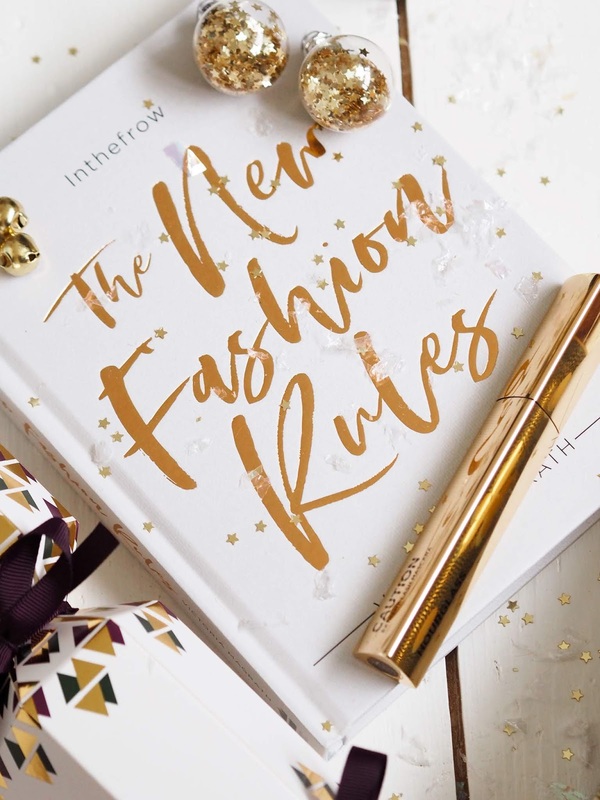 Anyone who follows Victoria from In The Frow or has an interest in fashion will appreciate her first book, The New Fashion Rules. It's a perfect coffee table book that you can dip in and out off, but it will be hard to put it down at the same time. Victoria details the evolution of the fashion industry and how the internet has shaped it and our style as we've moved into the digital age. It's a very interesting read and not like the majority of blogger books that have come out over the last few years. There's also some Instagram tips from Victoria that are super helpful. The post Christmas Gift Guide 2018 - Under £50 appeared first on Lelore. *This post contains press samples and affiliate links. Please read my disclaimer to find out more. I'm really not kidding when I say that I've had this post about the Marc Jacobs Coconut Fantasy Collection in my drafts since the summer! I bought a few bits from the collection when it launched on Net-A-Porter but then it sold out and came back in dribs and drabs. Luckily, Harvey Nichols has started stocking Marc Jacobs and the collection is now available across the two sites so I can share it with you. Patience really is a virtue it would seem! So after this long wait, is it really worth it? Marc Jacobs Beauty has always been a bit of an illusive brand in the UK with not much of a physical store presence and limited retailers to buy it from so I've held back not wanting to buy something that might not be suitable for me. Kinda kicking myself on that one now as it really is a good premium line. Warm eyeshadows have really taken over in the last couple of years and Marc Jacob's offering is beautiful. The Marc Jacobs Eye-Conic Longwear Eyeshadow Palette in Fantascene consists of seven shades, with a mix of four mattes, one satins and two metallic shades which allow you to create a plethora of multi-finish cohesive looks. The colour story really speaks to me with this one as its so versatile. I've created some really pretty every day looks and some more intense almost editorial looks as well. That sounds a little more fancy than the outcome as lets face it, I'm no makeup artist but it shows how much fun you can have with it! The richly pigmented copper shade 'Meet ya' in the middle is utterly gorgeous and looks incredible applied all over the lid with a wet brush for a foiled finish. This shade and the pink metallic 'She Said' next to it do have a little bit of fall out when applied with a dry brush so they need a very light hand - just a warning if you're heavy handed like I am. 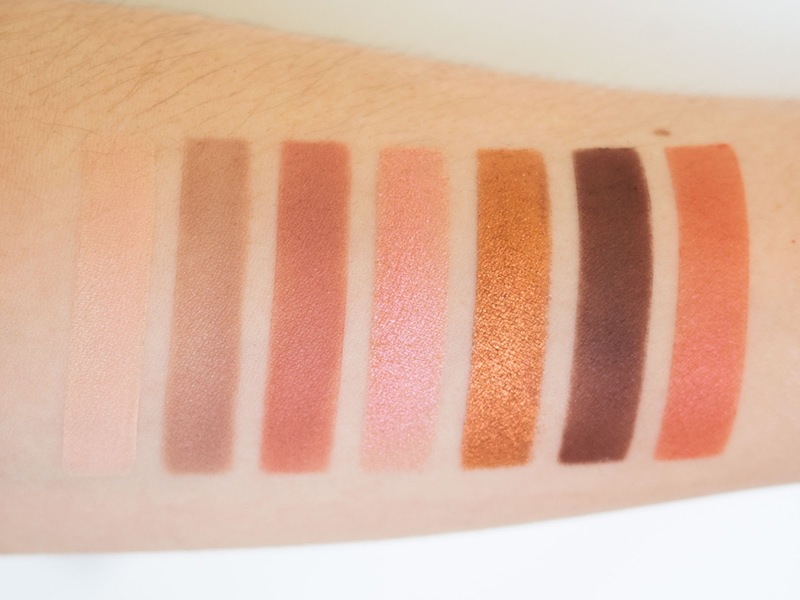 From the swatches below you can see how richly pigmented the eyeshadows are, including the mattes. They wear well and aren't at all chalky. 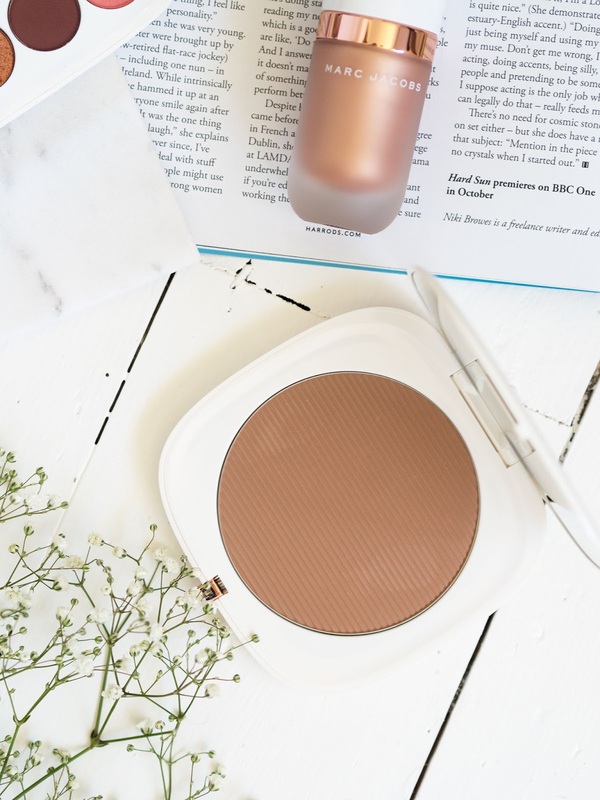 The Marc Jacobs O!mega Coconut Bronzer in Perfect Tan is the product that gets all the hype and I'll admit, tipped me over the edge to splash the cash. It was a limited edition launch last year and then earlier this summer, but now it's a permanent feature in the line. Not only is the compact gorgeous, it's the size of my head and the mirror inside is incredibly practical. The compact is substantial and weighty, but also slim so its easy to cart about with you. This bronzer will last for years, it really is that big! 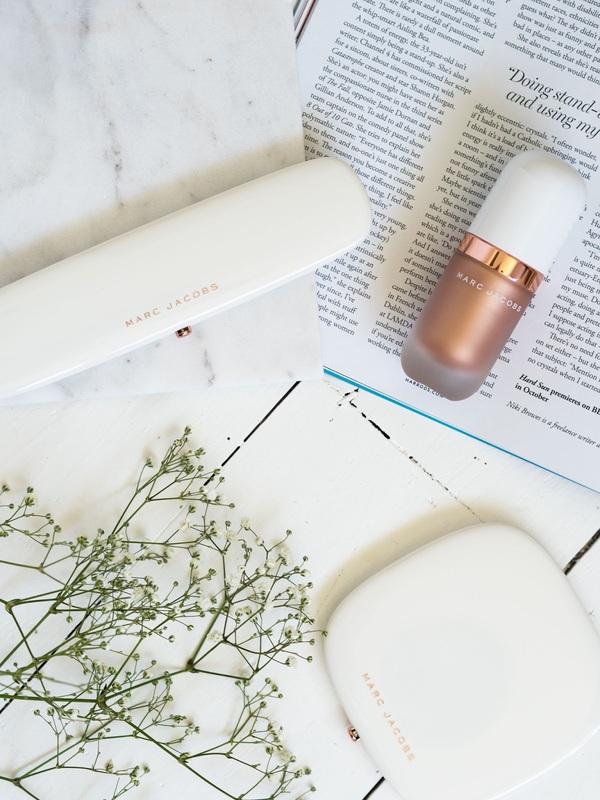 The colour is cooler than Marc Jacob's other offering and so it's really flattering on pale skin - something that I really struggle with when it comes to bronzers as so many are too warm and muddy looking on me. The Coconut Bronzer is infused with coconut so it also smells pretty divine, but not overpowering if fragrance isn't your thing. The formula deserves a mention too - matte but not flat and finely milled for a smooth application which is hard to go overboard with. I'm not the most experienced bronzer wearer so a buildable formula such as this is just the ticket and I'm into it an a big way. 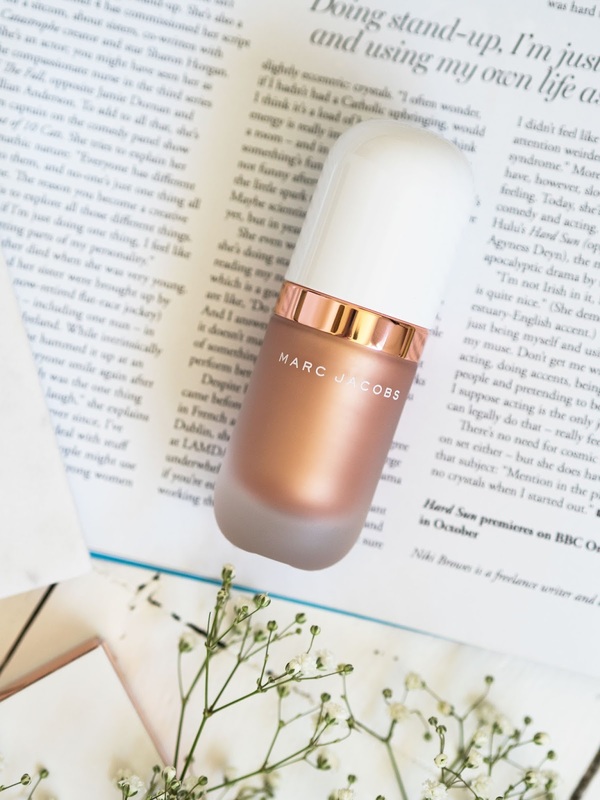 I'll be honest and say that the rose gold colour of the highlighter was too much for me to leave behind, but in hindsight the deep shade of the Marc Jacobs Dew Drops Coconut Gel Highlighter in Coconut Fantasy isn't really suitable for my pale complexion. If you have a medium or deep skin tone then this is going to be perfect for you. It's quite a rich and thick liquid formula which gives it the most amazing colour payoff but means that you can't sheer it out neat too much on the skin. How I've been wearing it is to mix a tiny drop with my foundation which in turn bronzes up my skin and gives the most amazing glow. It's also beautiful when mixed with a primer or moisturiser on bare skin. I was determined not to let it go to waste but as I said, it's just too dark for me as a highlighter. I really want to pick up the lighter champagne shade as it would be perfect for my skin I think. Since picking these up I've also tried out a couple of the gel highliners which are stunning. I had heard so much about them and they are really worth the hype. 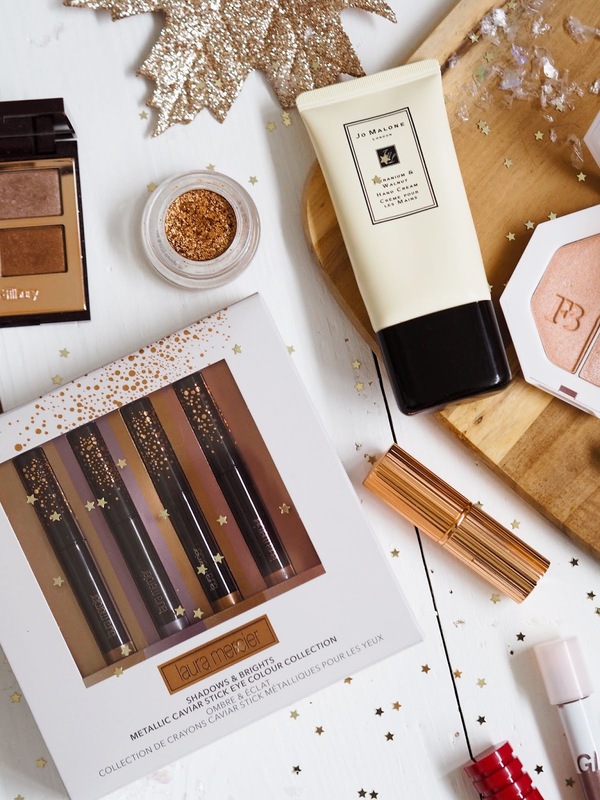 Harvey Nichols has also got the holiday collection in stock now and oh my word it's beautiful! 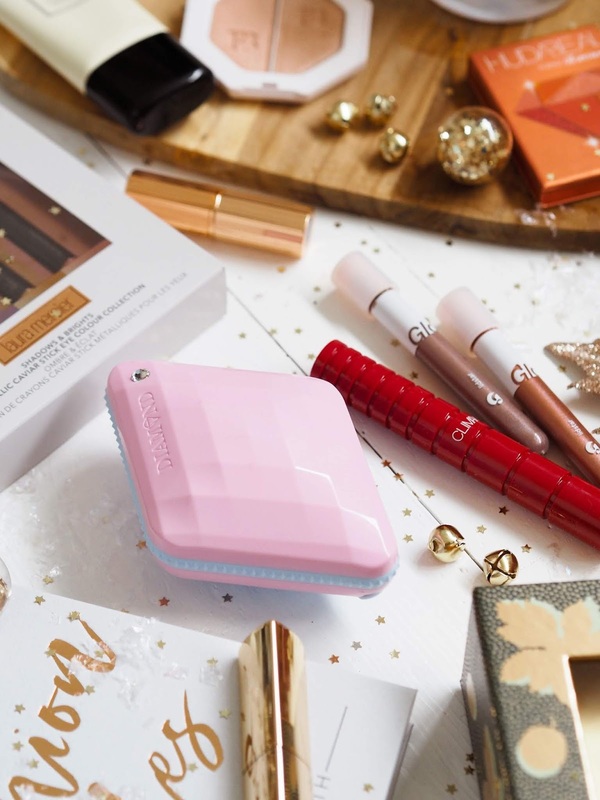 The packaging is gold and glossy and I'm going to have to steer clear or no one is getting anything for Christmas this year... Have you tried any Marc Jacobs beauty? I'd love to hear what products you rate from them. The post Marc Jacobs Coconut Fantasy Collection appeared first on Lelore. Cleansing brushes have been around for a while now and although I've dabbled in the past, they never became a long-term addition to my skincare routine. That's a product of my laziness and forgetting to put them on charge, but moreover because my skin is quite sensitive and the bristles over time irritated my skin. So when I discovered Foreo I wasn't sure if it would be a similar deal or not. In fact it worked out quite well and I used my Luna Play until it finally ran out of power (the Luna Play has a lifespan of 100 uses). I was lucky to be gifted the Luna Play Plus* which is a little bit larger than then the original and you can replace the battery when it runs out - life changing! The soft silicone 'fingers' as I like to think of them gently massage the skin as the Luna Play Plus vibrates, unclogging pores and removing much more dirt than a typical cleanse is capable. At the top there's some larger 'fingers' (I'm sure there's a proper name but bear with), which means you can really get into areas around the nose and t-zone that maybe need a bit of more of a deeper cleanse. I've been using this Foreo for a good few months now and I'm really into it. By just using it for a minute every day I've really noticed how much softer and brighter my skin is as it's truly clean each time. I also wanted to mention Foreo's cleansers as they're really nice to use. Quite often these add-on skincare products for cleansing tools are a bit naff, but both the Foreo Day and Night Cleansers* are lovely. 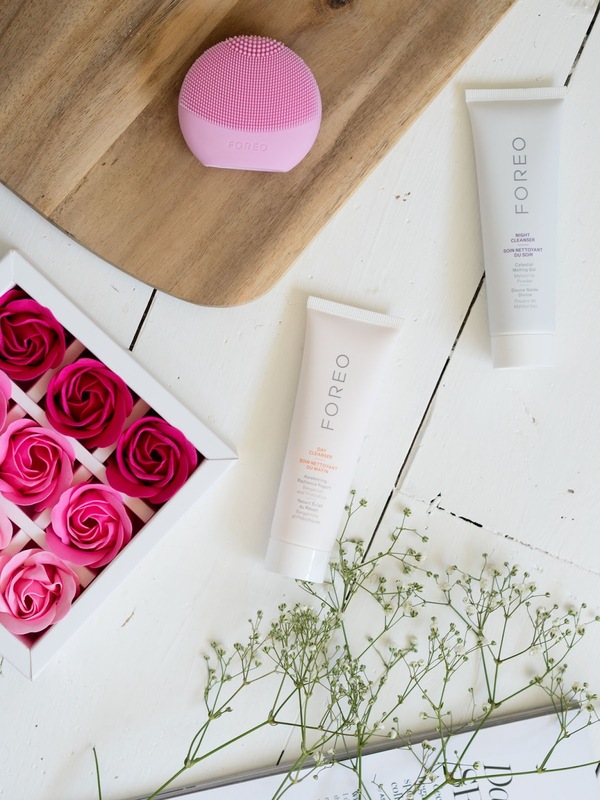 The Foreo Day Cleeanser is my favourite of the two as it's like a soft milky yoghurt texture - perfect for sensitive and reactive skin that needs a gentle yet effective cleanse. I have been known to use it at night too, what a rebel! It uses fruit extracts to revitalise and wakeup the skin and leaves the complexion soft and nourished, The Foreo Night Cleanser is quite unique, it's more of a gel with tiny meteorite powder particles in which gently yet deeply purifies the skin. Well worth a try if you're looking for something new. I've now set my sights on the Foreo UFO which is a super advanced mask treatment device. Have you tried it? The post Supercharged cleansing with Foreo appeared first on Lelore. *This post contains PR samples and affiliate links. The perfume addict in me always revels when the seasons change as I see it as an excuse to not only switch up my fragrance, but of course to treat myself to something new. 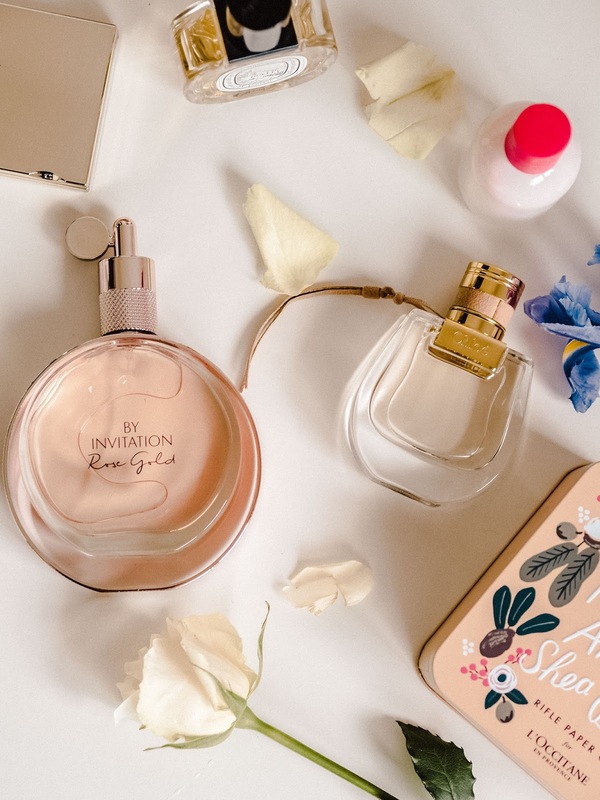 I have a fairly extensive perfume collection which you will know if you're read my blog for any amount of time, but the rush of something new is hard for me to ignore. Superdrug recently sent me a bottle of Gucci Guilty Absolute Pour Femme* to try out, and if you're into matching perfumes to the seasons, this is a bit of an autumn corker. I've never actually tried any Gucci perfumes before as all the popular ones that my friends had back in the day like Rush and Rush 2, were far too sickly sweet and never inspired me to check out the line which looking back is a bit of a crime on my part (sorry Gucci!). Gucci Guilty Absolute came out early this year and is a follow up to the original Guilty fragrance. Billed as a "non-traditional perfume for the modern woman", Guilty Absolute is a chypre fruity scent. The notes consist of blackberry - of which I'm a recent convert and is likely to be a autumn winter stable for my perfume tastes, as well as Bulgarian rose which is spicy and warm, goldenwood that provides a woody warmth and patchouli for depth. It's a bit like immersing yourself in the most scrumptiously soft and warm cashmere jumper and sipping a chai latte in front of a fire with your favourite candle burning. Warm spicy oriental floral scents tend to wear particularly well I find, and this perfume is no different. I'm really enjoying the fruity blackberry and of course the rose as let's face it, I never turn my nose up at anything rose scented and this one is very genuine and not at all synthetic as some can be. What's quite different about this perfume is that it has a linear composition, so once its combined itself with your skin and dries down it remains the same until it finally wears off. Gucci Guilty Absolute is one of my most reached for scents this season already, although as it is warm, deep and spicy I won't reach for it come spring. I guess when the time comes that gives me yet another excuse to pick up something new. Enable me, please! The post A New Gucci Perfume For Autumn appeared first on Lelore. It is hot. I am hot. And I'm also very much an autumn/winter person so this heatwave is not for me! Overly dramatic intro aside, like most of us I've been forced to re-evaluate my skincare routine and really define my summer skincare essentials. My skin is a delicate wee flower and although it's quite dry it doesn't tolerate thick, heavy products. So with that being the case, I thought I'd share my heatwave skincare essentials in case you need a helping hand in the heat. My summer skincare routine is very much focused on light, effective layers which I find to be the best way to nourish my sensitive, dry dehydrated skin without causing and irritation or breakouts. I always kick off my day with a hyaluronic acid based serum and Caudalie has a great affordable option at £29. 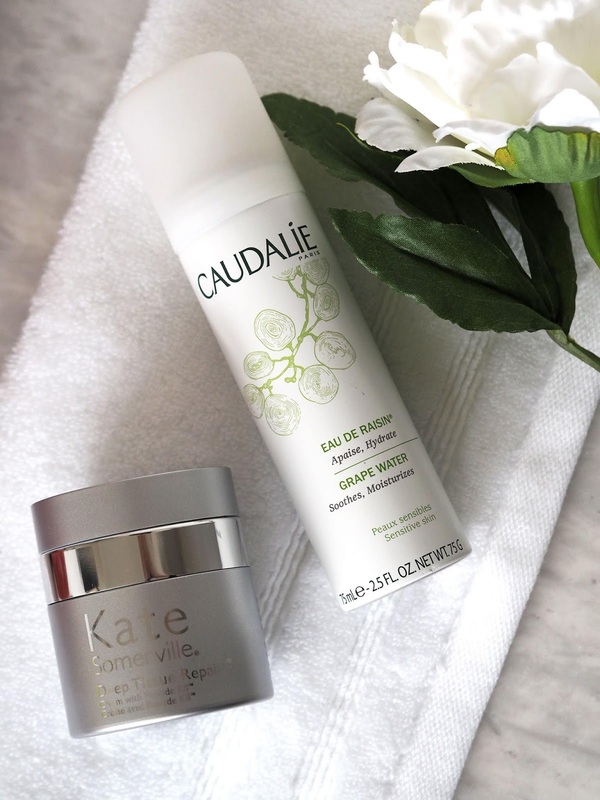 The Caudalie Vinosource S.O.S Thirst Quenching Serum* does sound inviting enough to drink (although I don't advise that you do) and my skin is lapping it up. Formulated for dehydrated skins, this light serum starts things off with a burst of hyaluronic acid and grape water which attract and seal moisture into the skin. As an oil-free product it's also suited to all skin types so no matter how oily or sensitive your skin happens to be this little guy will slot nicely into your routine. 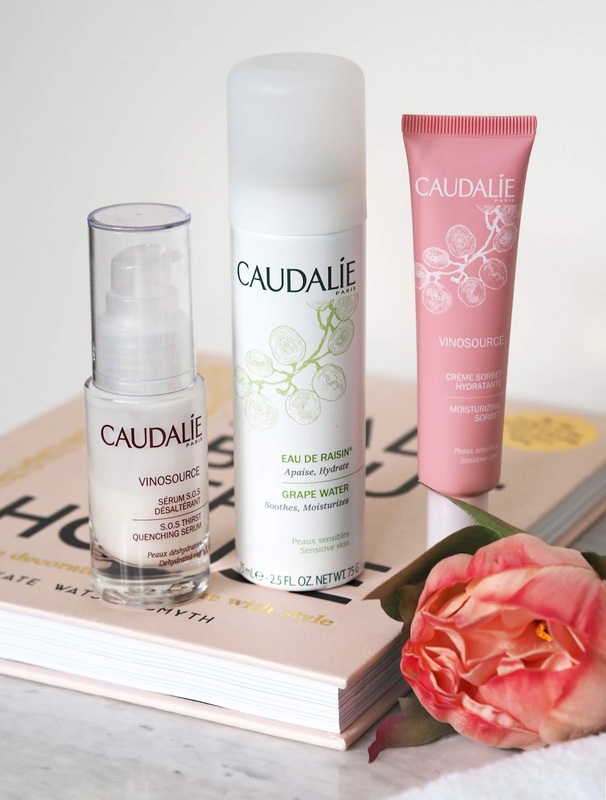 I've been following my serum with the Caudalie Vinosource Moisturising Sorbet* and it's the perfect pairing. It's a light whipped cream - almost a lotion, which again sinks in very quickly and surprisingly packs a fair amount of hydration. I would probably reserve this just for the summer months but it is more than enough for me in this heat. The Vinosource range is perfect for summer and for dehydrated skins all year round as it's designed to kick your skin into diffusing water and keeping hydrated whilst reducing sensitivity. 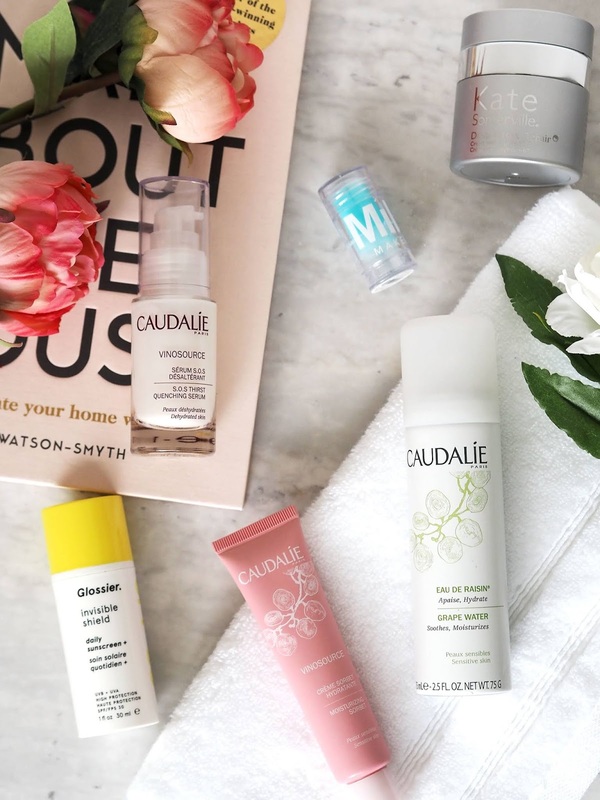 Oh and if you fancy a cute pink Caudalie branded reusable water bottle you can grab one for free when you buy two products from the Vinosource range which is pretty cool - I love mine. I obviously have to include an SPF in my summer skincare essentials - we all should. I'm much better at protecting my skin now than I did a couple of years ago. I'm borderline obsessed with SPF and antioxidants at the moment. I'm also looking into anti-pollution products too so if you have any recommendations please let me know. The problem with a lot of SPFs, and specially physical ones, is that they feel horrid on the skin which in turn makes us so much less likely to wear them and so we're not protecting our skin at all. I'm so glad the Glossier Invisible Shield exists because it's unlike any other SPF I've tried before it. It's a chemical formula which is almost clear and feels like a light hydrating serum so it fits perfectly into my light layers routine. It's pleasant to use, factor 30 and provides a great base for makeup so I want to use it every day. My skin still likes a treatment in these warm summer evenings, albeit something lighter and definitely not potentially pore-clogging. 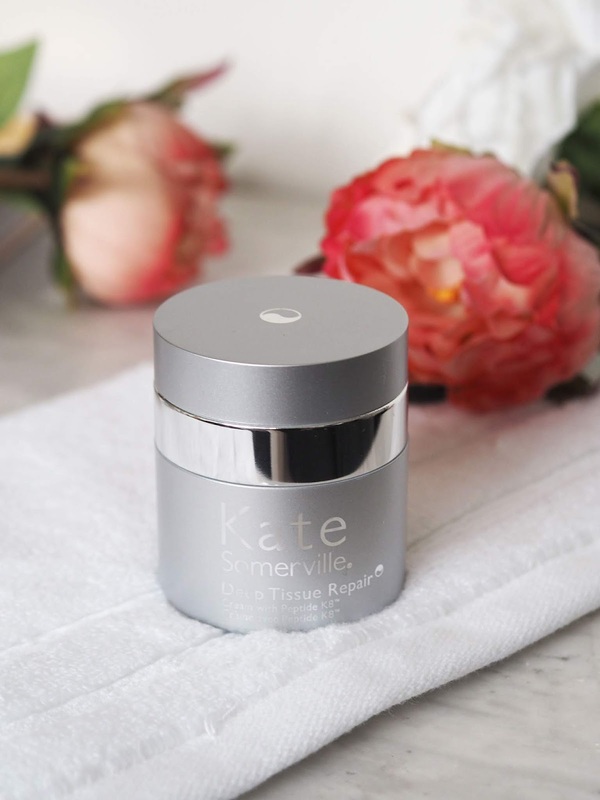 One of my all time favourite moisturisers which doubles up as a treatment is the Kate Somerville Deep Tissue Repair. I feel quite bad sharing this actually as its impossible to buy this in the UK at the moment. This is coming to the UK apparently but they're having to have their entire product range EU approved which is a lengthy process. Hopefully it won't take too much longer as I'm about to run out! 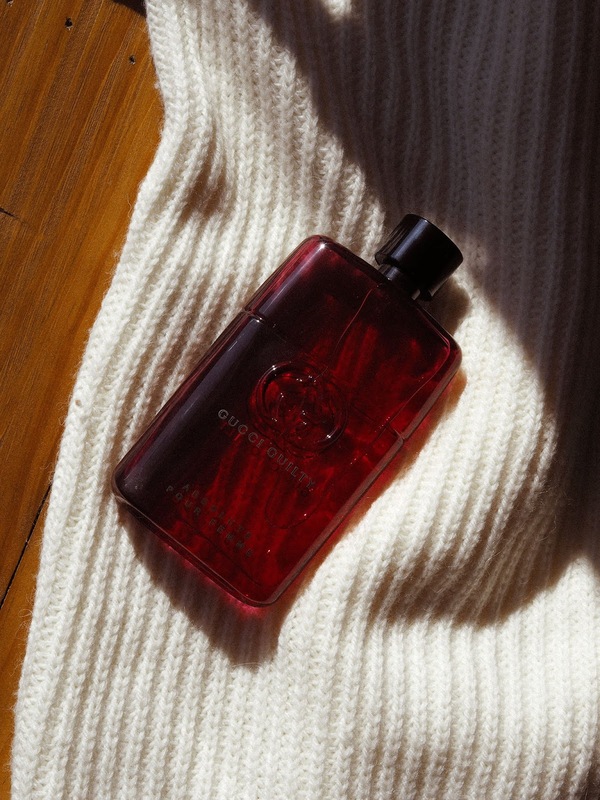 It's deeply hydrating, yet light and silky. It does a little bit of everything as it hydrates, firms, restores elasticity and softens wrinkles - a real powerhouse. It's the one thing I will forever be badgering friends travelling to the States to bring back for me. Yep, it's that good folks. The lack of air con on public transport and fresh air in my office will forever haunt me but I have a couple of summer skincare essentials that combat this quite nicely. A facial mist is a given in warm weather for me, but this little dinky Caudalie Grape Water pops neatly into my bag and comes out quite frequently actually. The mist is very fine so doesn't tamper with your makeup - however it's a perfect refresher should things be looking a little dry and worse for wear. Incredibly cooling and soothing for sensitive skin in the heat, it also makes a great hydrating toner. My last little summer skincare essential is pretty tiny actually, and I must admit I wasn't 100% sure what it was for when I picked it up in New York earlier in the year, but this sample size of the Milk Makeup Cooling Water intrigued me. I'm not sure if it's supposed to be skincare or perhaps a primer but I use it to refresh my under eyes when I'm not wearing makeup and it's also good if you have a SULA situation going on... Yep, it's perhaps a little bit gimmicky but this balm-like stick is refreshing on the skin and is meant to de-puff under your eyes. I haven't used it consistently enough to see any long-term results but it does feel nice to use and its teeny and we all like minature things, right? What are your summer skincare essentials? The post Summer Skincare Essentials appeared first on Lelore. This post contains press samples and affiliate links. Please read my disclaimer to find out more. It's been a little while hasn't it? There's been many times these past eight weeks since I last posted that I've sat in front of a blank blog post, ready to set my fingers to the keys and yet nothing came out. No inspiration, no jolly demeanour, just nothing. That's the thing when we're stressed, you just can't force it and need to down tools and practise a little self-care. Over the last few weeks I've really struggled with various unplanned events, family illness, an immense work load and general bad luck that it zapped my time and my joy for blogging. For the first time in a long while I feel energised and ready to crack on with things again. Seeing as self-care has been so incredibly vital to me lately I thought I'd share the beauty rituals that have made me feel a whole lot more human and ready to tackle everyday life again. Beauty is sometimes considered vain, but for me its a quick win for taking me from feeling poop to fantastic! I figure that if I can do just one small self-care thing a day it's to take some time out in the tub and soak away everything that's grating on me. I find that a bath can shake off a bad mood, a headache and aching tired limbs, so it's my does-it-all solution. What really aids this is a relaxing bath oil. 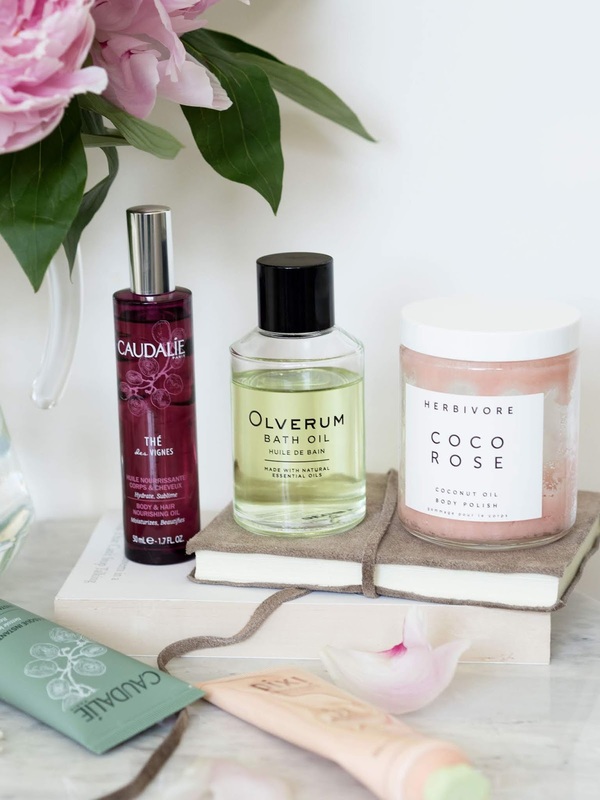 I've dabbled with many oils over the years, from the most purse friendly options to something a whole load more luxurious and fancy but I always return to the Olverum Bath Oil. It's pretty affordable and my local apothecary sells it so its easy to stock up when I'm running low - a situation that I don't like to happen! Yes, we actually have a local apothecary - Apotheca, and it makes me feel quite fancy telling you that! I've lost hours in there looking at all of the pretty jars. Back to the oil... 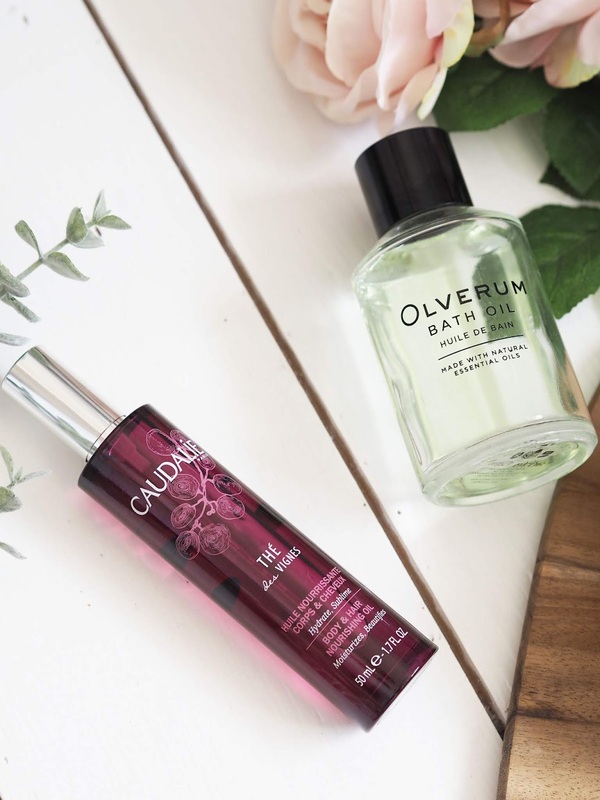 The Olverum Bath Oil is super concentrated so it lasts for such a long time, making it incredibly economical. The essential oils create such a feeling of wellbeing and relaxation that I look forward to my evening soak all throughout the day. I am the worst at nourishing my limbs, which considering how well I look after my face is just criminal! So when I take time to keep my skin smooth, soft and moisturised it really elevates my mood and means that I nod off much quicker each night. Starting with the Herbivore Coco Rose Body Polish which I basically bought as it looked so pretty! Luckily, as well as looking good in my bathroom it's one of the best exfoliators I've used in a while. It's sugar based and infused with Moroccan rose and coconut oil and so its incredibly nourishing as well as packing a punch in the scrub stakes. It's perfect for sensitive skin as its not at all scratchy, yet it removes all of my bumpy skin. I gently massage it in until the sugar dissolves into a soft oil, revealing the most smooth and nourished skin. I'm smitten in case you can't tell! With my body all sorted, there's nothing I enjoy more in a self-care session than a face mask or two. Having a bright clear complexion so that my skincare works better and my makeup sits well makes me very happy so I indulge in a couple of face masks every week. At the moment where I'm feeling stressed and dealing with the heatwave we're having in the UK, keeping my skin happy and decongested is my number one aim. Gentle exfoliators such as the Pixi Peel & Polish are what I reach for as it does the job very quickly without the need to physically exfoliate and potentially irritate my complexion. Pixi's offering relies on lactic acid which is super gentle, and enzymes to slough away dead skin cells and leave a much brighter complexion. This is the best exfoliator to go for if you're used to manual scrubs but want to dip into chemical alternatives. It has a very fine amount of sugar granules that make it feel like a traditional scrub, and yet there's no need to buff it into your skin. 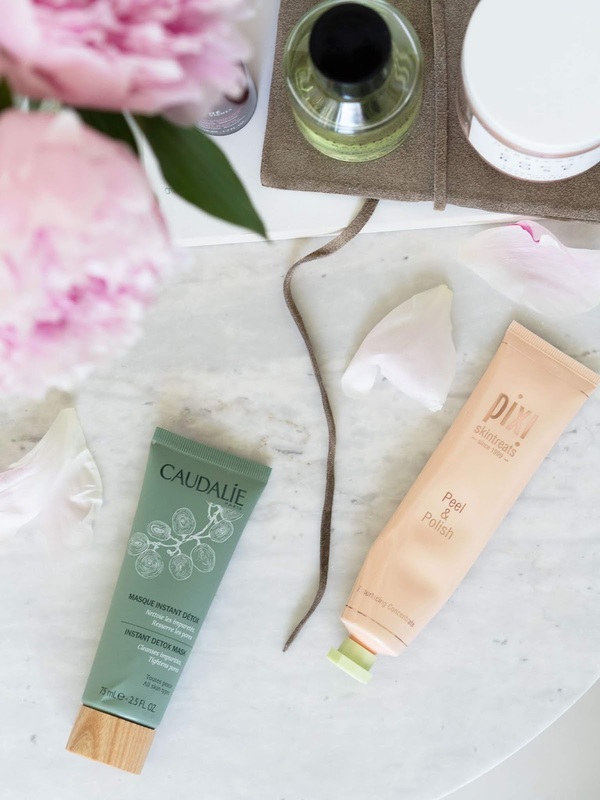 To go in a little deeper and clear out any nasties, the Caudalie Instant Detox Mask* is just the ticket. I'm not usually a fan of clay masks as so many that I've tried have felt awful on the skin and break me out, but this beaut from Caudalie is my perfect solution. Grape marc draws out impurities and toxins which are then absorbed by the pink clay. As this is a clay mask it does dry down a bit but doesn't have that awful tight my skin might crack feeling which I absolutely hate. It's also really easy to remove and leaves my skin feeling comfortable and ready to go with some serums and treatments. A hero of mine for sure. What self-care beauty rituals do you practise? The post Three Simple Self-Care Beauty Rituals appeared first on Lelore. The irony of writing a post about perfumes for spring when just yesterday I had to get my winter coat out again is not lost on me. Just when we thought spring was finally on its way! 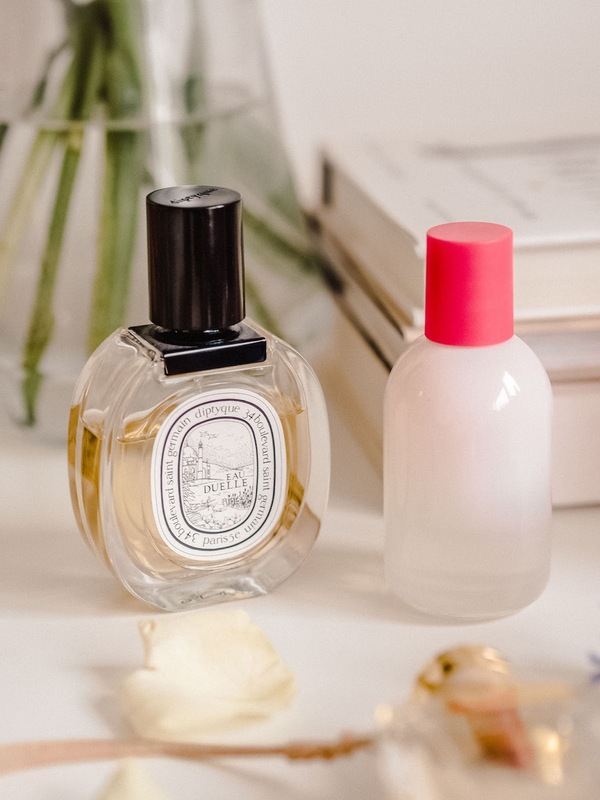 The weather may be letting us down but as far as I'm concerned it's May and I'm cracking out my uplifting spring perfumes and sharing them with you today. I am not a celebrity perfume fan but any means. In fact I think this is the very first one that I've graced my skin with. Michael Bublé's first foray into scent, By Invitation, was incredibly well received when it was launched a couple of years back and so when its follow up came out my interest was piqued. 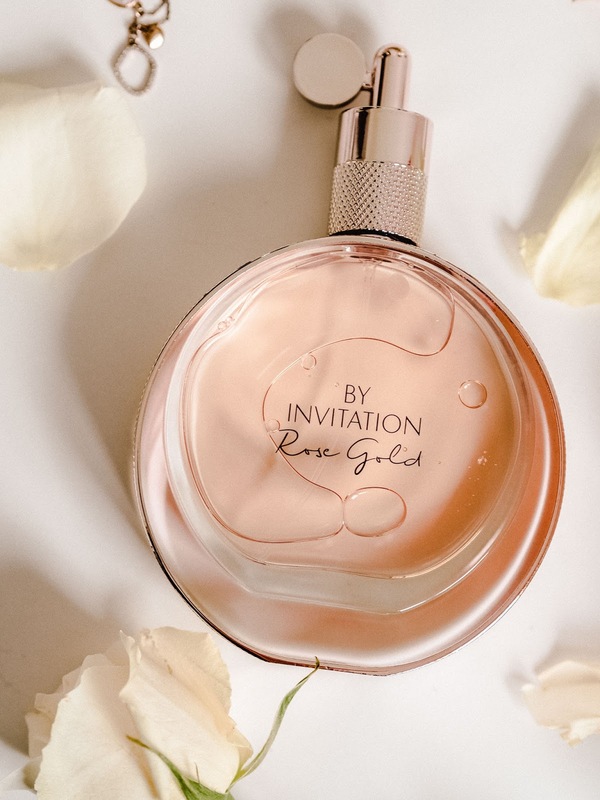 By Invitation Rose Gold is a floral oriental gourmand, so there's a nice dose of warmth in there but its a complicated and well layered perfume. 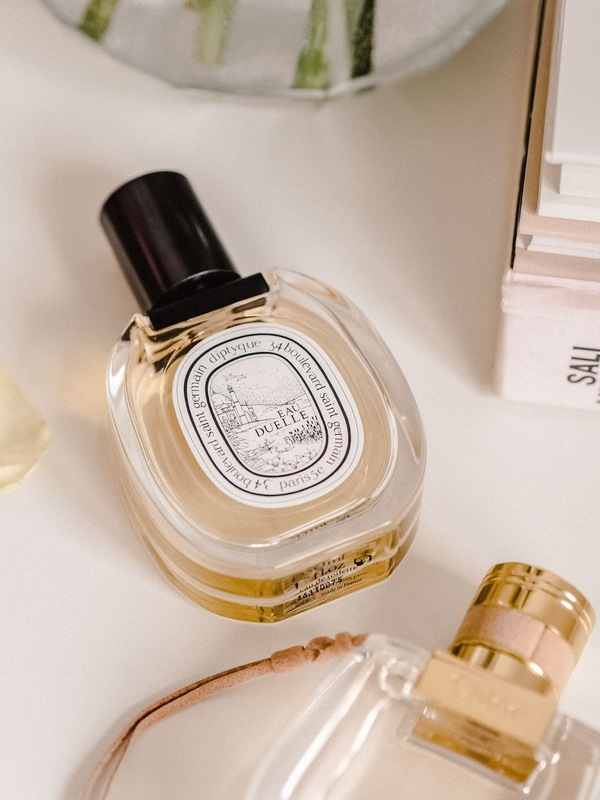 It opens with magnolia and pear, which gives it an uplifting spring vibe to me and then leads into the floral notes of rose, peony heart and black plum for some depth. As I mentioned it is a gourmand and that's all owing to praline and vanilla which make it buttery and rather addictive. And of course I cannot skip over the beautiful weighty rose gold package which looks absolutely divine on my vanity. Grown up and delicious, this is exactly how I want to be smelling during spring and summer! If I’m ever having a day when I want a light fuss-free perfume this is the one I reach for. 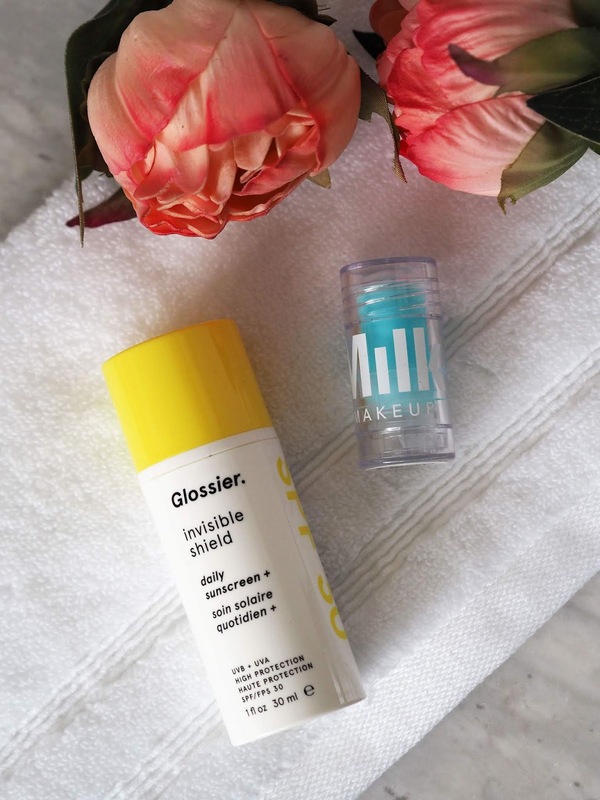 Formulated with a focus on sensual base notes such as ambrette, musk and ambrox, this subtle Glossier pick stays unchanged throughout the day and is a soft powdery floral which enhances your natural scent. It’s very much you, but better! I find a certain comfort from wearing it and it’s never too harsh or overly flowery. I wish actually that their body hero range smelt more like this so I could layer it. Not to say I’m not a fan of the body hero range as I am, but I am a sucker for layering scents for the full experience and longevity. I do love a bit of freesia so it’s no surprising I get on so well with Chloe fragrances. It’s just a lovely fresh floral which instantly lifts my moods, so Chloé Nomade is an awesome spring pick for me. 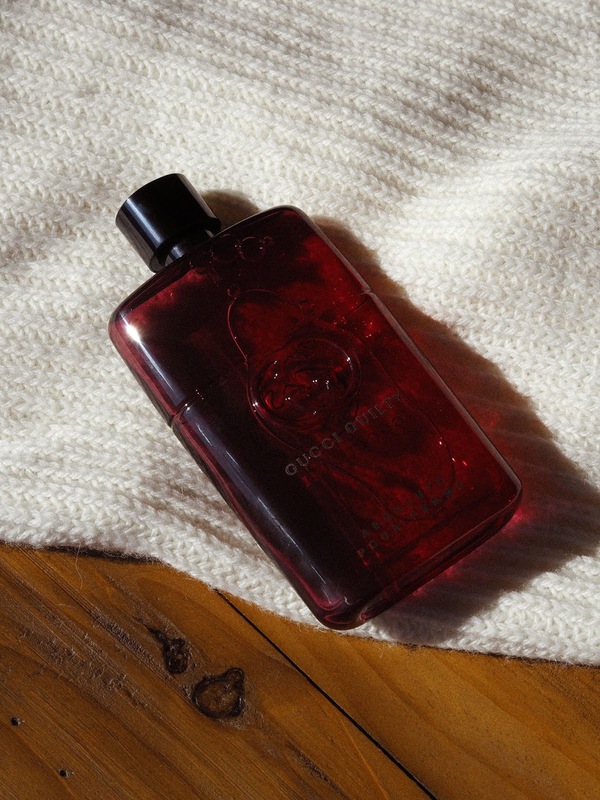 It’s a lot deeper and sensual than we’re used to from Chloé, owing to Mirabelle plum and oak moss. It’s fresh, fruity and chypre, so a little more complex and interesting. It wears well throughout the day, with the fresh freesia always peeping through to keep it uplifting and light. Oh and how gorgeous is the bottle, seriously! I've not spoken about this little love of mine for a while which is quite honesty a crime in itself. Eau Duelle is not your average vanilla scent. It's actually quite woody and spicy due to pink pepper, bergamot, saffron and musk so it has a little bit of a kick to it. The vanilla is still quite fresh but without being too creamy, very much a 'real' vanilla if you know what I mean. Quite often vanilla perfumes can be very synthetic and sickly but Eau Duelle couldn't be any less like that. It's a perfume I reach for all year round so its never going to leave my side in the summer months. I can see this being with me for many years to come, much like No 5. 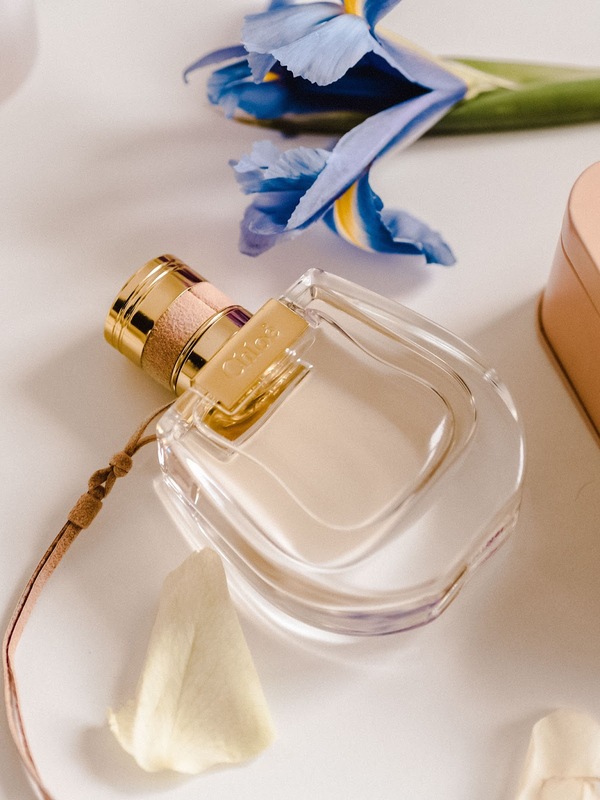 Do you have a favourite spring perfume and what do you think of mine? Tempted to try any? The post Spring Perfumes appeared first on Lelore. 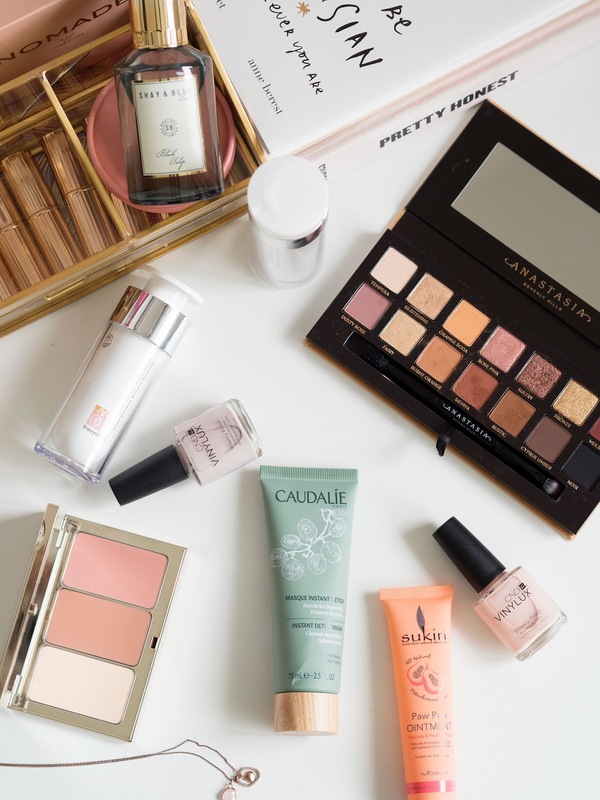 I’ve been testing so many new products over the last few weeks that I thought it was about time I wrote a round up on what’s hot. We’ll also forget that I’ve not written a monthly favourites post for a while as I honestly don’t know where the last couple of months have gone! I’ve been busy, that’s for sure. Now you guys know how much trying new skincare excites me, right? I should probably get out a bit more! 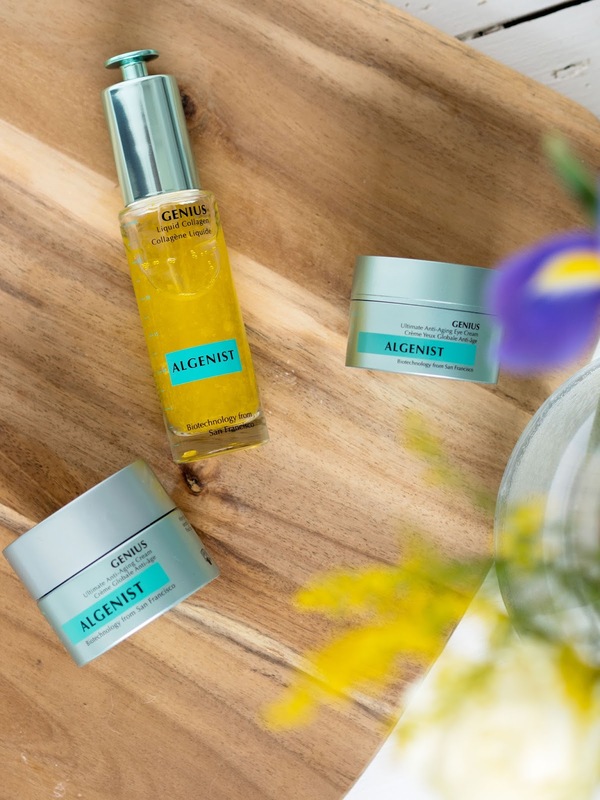 So I was very happy to get the chance to put a few products from the Algenist Genius range through their steps and you know what, I'm really impressed. It's definitely in the higher price bracket, but as someone with visible signs of ageing I'm happy to invest in my skincare. I don’t travel all that often which really shows when it comes to packing. I just can’t (or won’t) travel light when it comes to my skincare routine. While I’ll gladly just take one pair of shoes and not 2835 tops that I know I won’t wear, what if I need three different face masks, a choice of cleansers and two moisturisers just in case? It happens every single time because refuse to let my skincare routine and ultimately my skin suffer, even though most of it never gets used. Concealer is one of those products that I feel I'm always searching for the next best one. 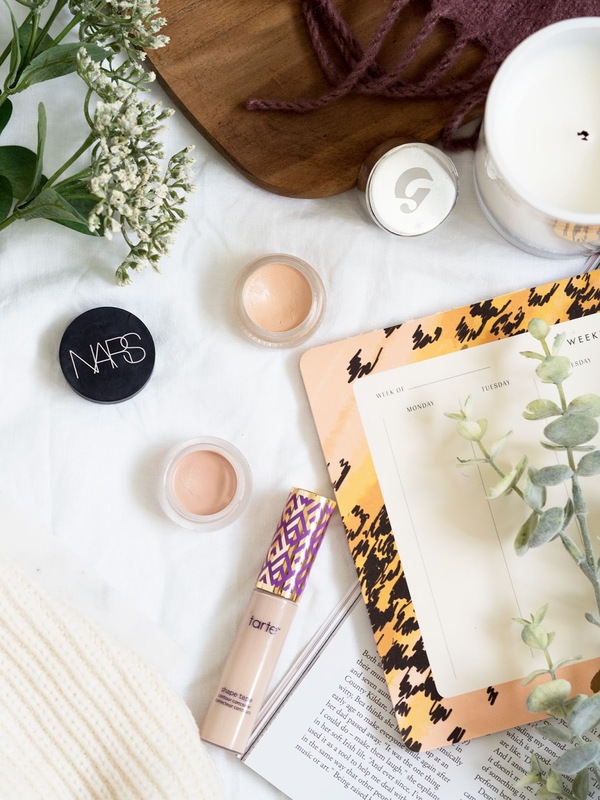 I have been known to repurchase a select few (NARS Radiant Creamy Concealer I'm looking at you) but generally speaking I'm always on the hunt and reading as many reviews as I can.